Green Gab is all about keepin’ it Green! Green Homes, Green Living and Green Companies. Get in on the gab and learn why green matters – to you, your family and friends and how it directly impacts your community! 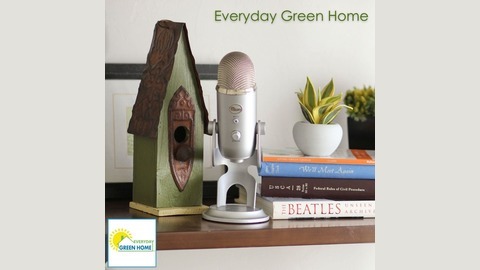 Join Marla Esser Cloos and Tony Pratte as they talk with Green Experts from a variety of industries, companies and organizations to help you learn the true gift of Green Gab! How do you look at your stuff? There’s a lot of stuff that makes up your home. When you think about it, your home is a collection of a bunch of resources, materials, and systems. Or, in other words, a lot of stuff. How can you look at the stuff in your home in terms of the three R’s when you bring in more stuff? It can be a fun challenge to bring more stuff in your home following the three R’s: reduce, reuse, and recycle. Anytime you can reduce the amount of material you use, you win. This not only simplifies your life, but also reduces the amount of materials and how much it costs to put those things together for your home. For instance, maybe instead of putting flooring down, you may just want to finish the concrete. The simpler you can make it, maybe even by using a system, that can work to your advantage. There are secondhand stores everywhere, so this is pretty easy. Have you checked out Habitat for Humanity’s ReStores? They have so much stuff in there, and it changes all the time. It can be an adventure to search for used furniture and household goods for building materials. You might even be able to reuse components from homes that are being torn down, remodeled, or redecorated. How about taking an old door and turning it into a table or transforming a tabletop into a barn door? This is probably the one R we see the most. A lot of us have curbside recycling bins, so we feel like we’re constantly feeding the system. And we’re giving those materials a new opportunity for a new life when they’re recycled. Unfortunately, we don’t have enough places demanding those recycled materials, and a lot of our recycling efforts are not coming to fruition. But you can make a difference when you put new stuff in your home that has recycled components, such as flooring and paper. What Is the Stuff in Your Home? 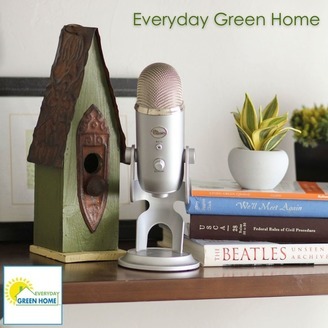 You’ll get all kinds of ideas on how to get the right stuff in your home in this podcast. Be sure to check back for new information regularly on how you can make your home greener by using the three R’s plus other ideas!